What do dentures, retainers and nightguards have in common? 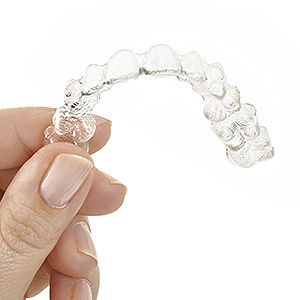 Along with orthodontic aligners and athletic mouthguards, they’re all types of removable dental appliances. They also share another commonality: each one depends on the wearer caring for it to ensure its longevity. The most important thing you can do for your appliance is to clean it regularly. Don’t use toothpaste, though, even with dentures: while your natural tooth enamel can handle the abrasive particles in toothpaste, your appliance’s materials may not. Toothpaste can create tiny scratches that can harbor disease-causing bacteria. Instead, use liquid dish detergent or hand soap with warm water. Although boiling water may disinfect your appliance, it’s not advisable to use. Even hot water can distort plastic components and warp the appliance’s fit in your mouth. Likewise, don’t use bleach, which can fade the plastic color used to resemble gum tissue and break down the material’s composition. When you clean your appliance, use a brush — but not the one you use for your natural teeth. Use a soft toothbrush, a nail brush or a specialized brush for appliances like dentures. You should also protect your appliance from damage. Some appliances like dentures have parts that can break if they’re dropped on a hard surface — like the porcelain in your sink. To prevent this, place a towel in the sink to cushion the appliance if it accidentally slips from your hand during cleaning. And when the appliance isn’t in your mouth, don’t keep it on a low table or night stand where small children or pets can easily get their hands (or paws) on it. And one more thing: don’t wear your denture appliance around the clock — take it out, for instance, while you sleep. Leaving dentures in interferes with the acid-neutralizing and antibacterial function of your mouth’s saliva, which could increase your risk of disease (and bad breath). Appliances can be an expensive investment in your dental health. By following these guidelines you’ll help protect that investment for years to come.